Motorcycle riders mostly wear leather or thick textile suits, which give them protection in case of an accident. The preferred colour of these suits is black or other dark colours combined with black. 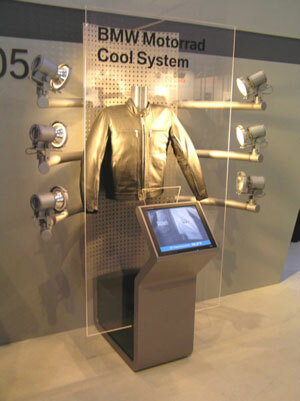 While driving the temperature of the suits will not exceed the surrounding air temperature as it is cooled by the wind. But as soon as the biker stands still the dark suit will absorb a lot of heat from the sun and the biker will be exposed to an enormous heat stress. 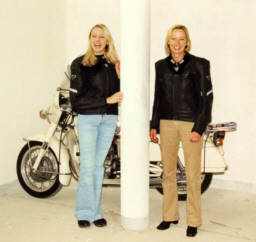 The lady on the left of these pictures is wearing a “cool” leather jacket whereas the lady on the right is wearing a standard black leather jacket. Before these pictures were taken both have been exposed to sunlight for the same time period. and ask for skai® cool colors for this application.